In order to apply your special make-up professionally, a functional correct make-up brush is extremely important. No matter if you want to put on a beauty make-up or a special Halloween make-up with the flat make-up brush, with the professional make-up brush made of soft nylon, you are well equipped for all kinds of make-up techniques. 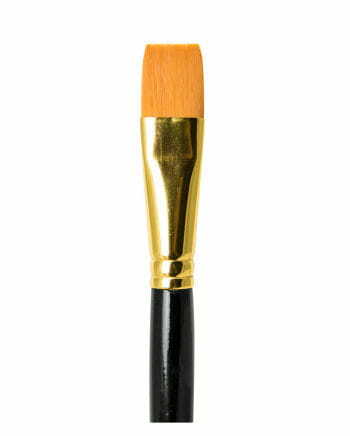 The makeup brush has bristles made of soft nylon and has a brush surface of 16 mm, which is attached to the shaft with a brass-colored metal sleeve. With the professional make-up brush for make-up artists and hobby make-up artists, Aqua make-up and cream make-up can be professionally applied. With your make-up highlights, as well as working out shades clean, is no longer a problem.